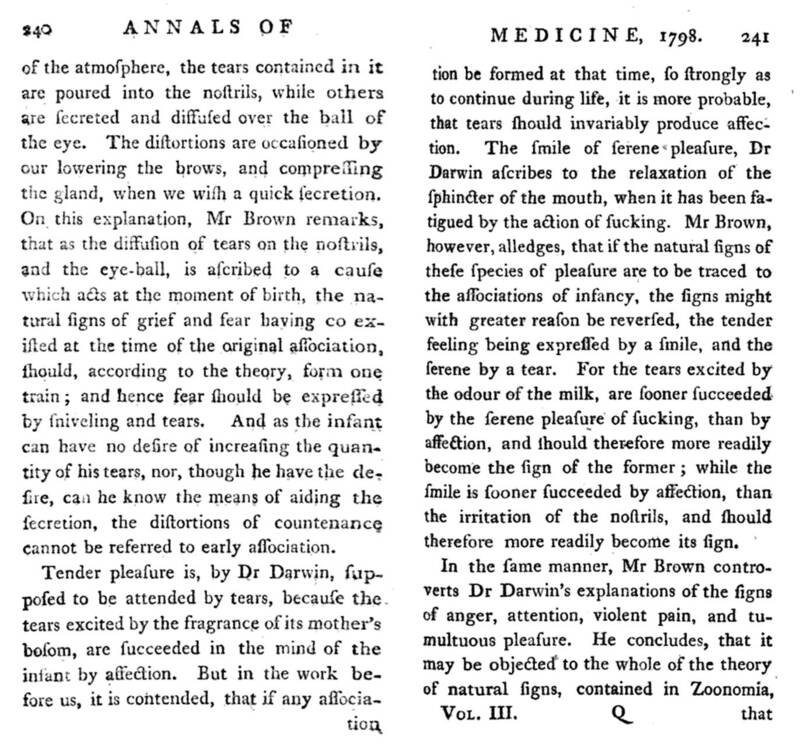 Before Charles Darwin there was Erasmus Darwin, his grandfather, who was a slightly more humble, less aristocratic scientist, philosopher and preacher for the common good. In some ways, Erasmus was an important predecessor to his grandson Charles Darwin. Everything that Charles Darwin wrote about concerning evolution and any parts of his philosophy that stood against the teachings of the church were a direct consequence of his grandfather’s logic and belief system. Both Charles and Erasmus were learned people with lessons and teaching highly representive of the natural philosophy for the time. During the late 1700s and early 1800s, the lessons of science were slowly evolving from a belief system and nosology based on creation and God, with the products of nature considered gifts that were bestowed upon us following our departure from the Garden of Eden, to a belief that removing some or all of God from this interpretation, claiming everything was a result of some natural selection processes. Comparing Erasmus to his grandson Charles, Erasmus was a writer and scientist with much respect for the church but a considerable knowledge in natural philosophy and the urge to write to people who were just as much interested in learning more about the sciences as they were how these teachings related to the church. By the time Charles was a scholar in this field of study, some of these rules the church had set about science had changed, and science was very much its own philosophy, a philosophy in need of lengthy testimonials about whatever evidence existed to prove its various claims. During the early 1800s, the evolution of life process was dependent upon a Garden of Eden based interpretation of nature and nature’s resources being the result of awards and punishments we received for the ultimate sin. With much of this same thinking Lamarckianism came to be, which claimed that if you changed your personal habitats or adapted your behaviors so as to compensate for local changes and differences, then you were rewarded for these changes by allowances of your continued survival. This award was a consequence of nature and the environment, not the consequence of any decisions being made from the heavens above. In contrast, nature could be very viscious and insensitive to personal needs as well. When you got stubborn and refused to change whatever it was that was making it difficult for you to survive in your living environment, you and other people or beings like you were ultimately extinguished, not sent to hell, just left without the vital force needed to keep your corpse alive. According to religious and science writers for the time, natural laws made you who and what you area. These laws were either acts of God or acts of Nature, or both, with God’s Laws and behaviors that ignore these laws more a series of events of the past. According to natural philosophers not necceesarily bound to church related teachings, the laws of Nature defined who you are and what you become, not some judge overseeing your basic living habits. Within this setting, if you believed you were a consequence of fate, then your fatalism did you in. If you believed yourself to be a product of nature and not to product of any immediately active Superior Being, then you were ultimately nihilistic in whatever it was that you decided to do when your life and life force were put to the test. Whatever medicine you practiced was determined by these paradigms, as well as any and all subdivisions in faith that existed between these two extremes. So until Charles Darwin could produce his summary of evolution and life, those who were most devoted to the Naturalistic way of being needed someone’s philosophy to latch on to, to make sense, to assist in their future growth and development. Lamarckian philosophy assisted people in making this leap from Biblical faith to faith in Nature and nature’s creator. Lamarckianism worked for several decades at keeping the scientists active in the arguments that ensued about science version religion from the late 18th century into the mid-19th century. Lamarckian philosophy enabled the sommon person’s mind and philosophy to make better sense of topics that like religion were very philosophical in nature, but lacked the background literature needed to promte these ideologies further. For this reason, it was people like Erasmus who were both scientificly and religiously trained that enabled such events to happen. 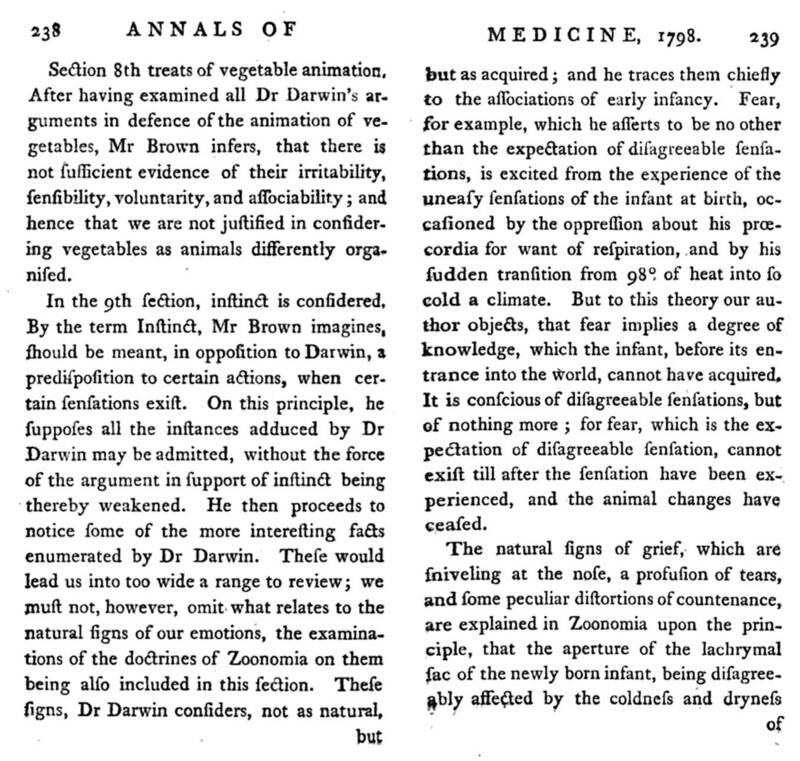 Erasmus’s work provides yet another explanation to provide for who and what we are as living beings, and why these creatures of nature or of the Creator on occasion do not always experience the perfect life, by becoming ill and diseased. 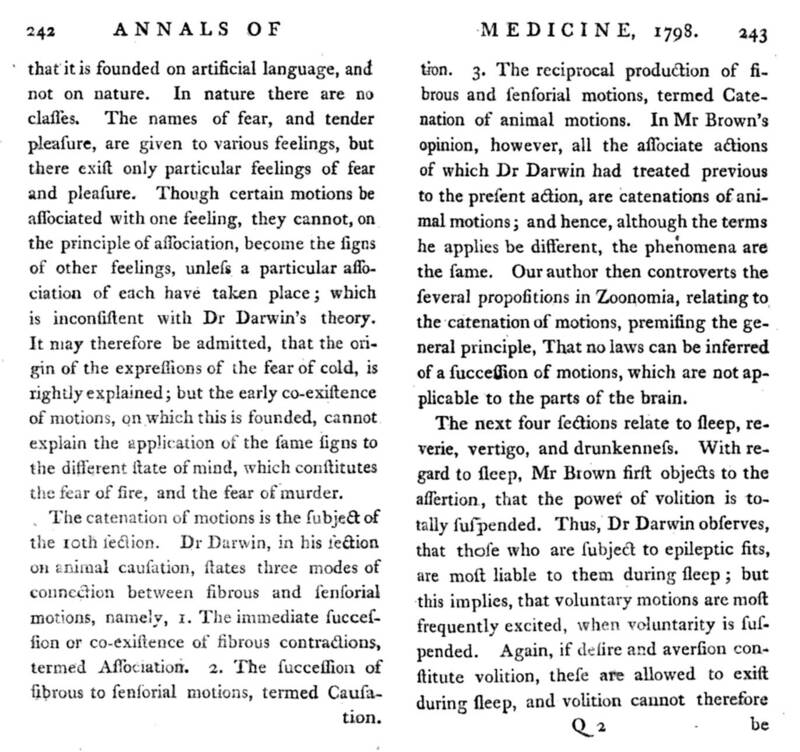 Erasmus Darwin termed his philosophy zoonoism. It is a product of his interpretion of life with a very obvious metaphysical slant to his belief system. 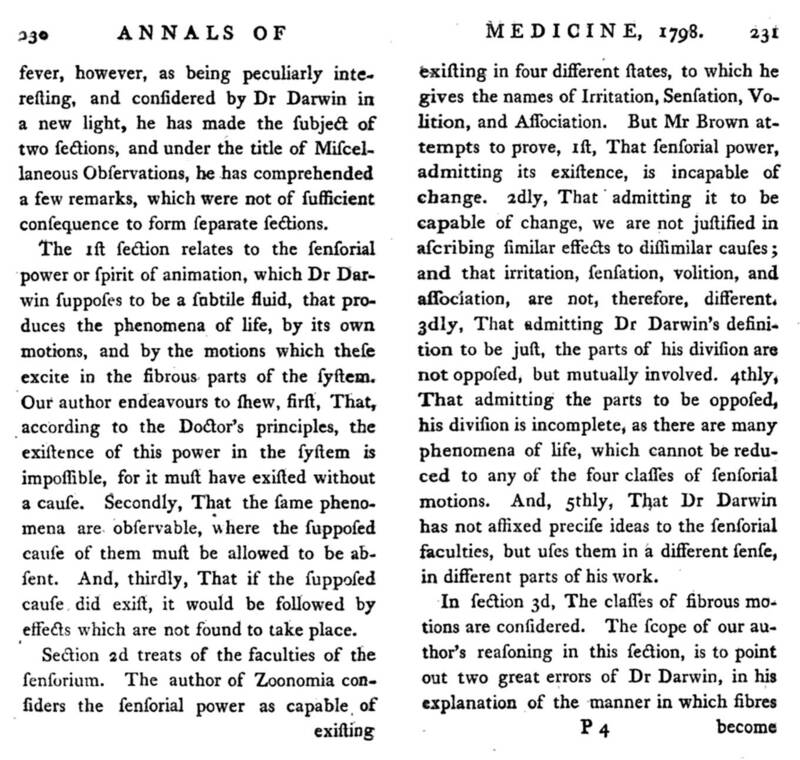 Erasmus’s philosophy would greatly differed from that of his grandson Charles, whose theory of evolution would become the final step needed to bring scientists out of the cavern they resided in as researchers, engaged in an exploration of the world around them which seemed only visible to those aimed in the right direction, beneath the guise of church born philosophies. 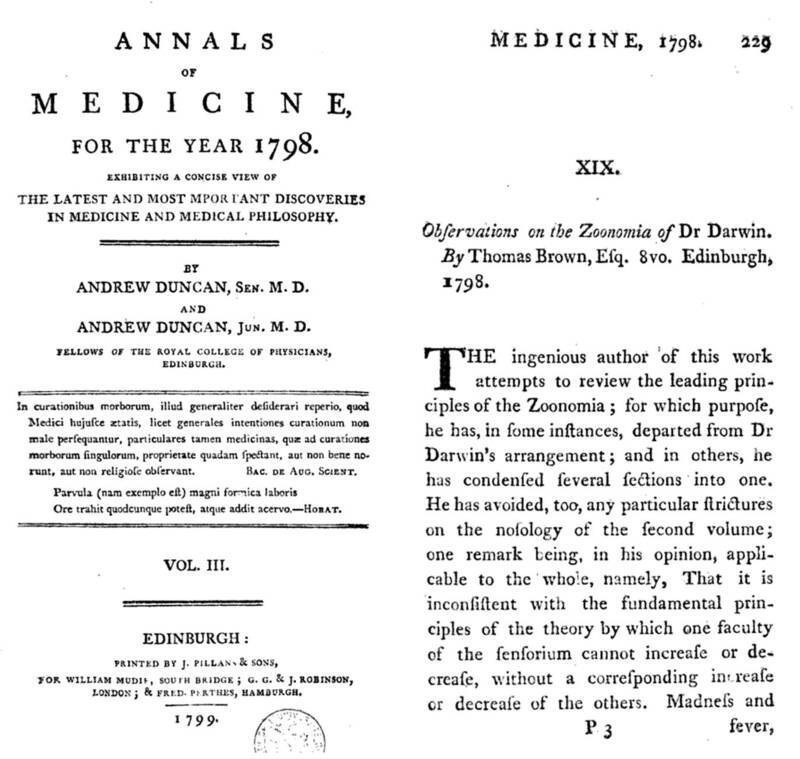 This article on Erasmus’s Zoonoism is a review of Erasmus work and the writings of its interpretor Scottish Metaphysician Dr. Thomas Brown. 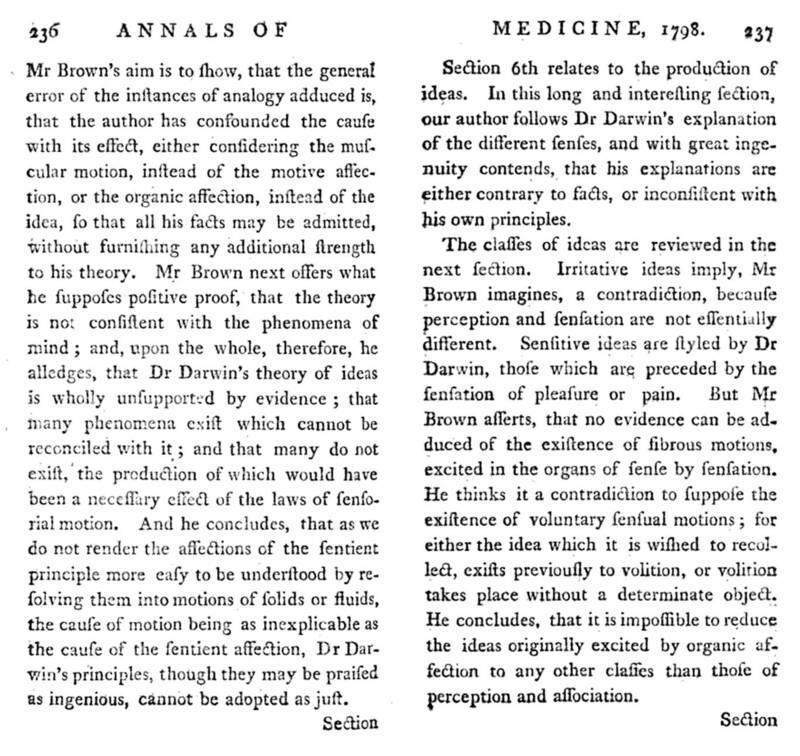 This Dr. Brown is not the same Dr. Brown whose writings initated the atomism and energy/vibration, very Newtonian-like theories that much of Brunonianism was based on during the late 1790s and early 1800s. 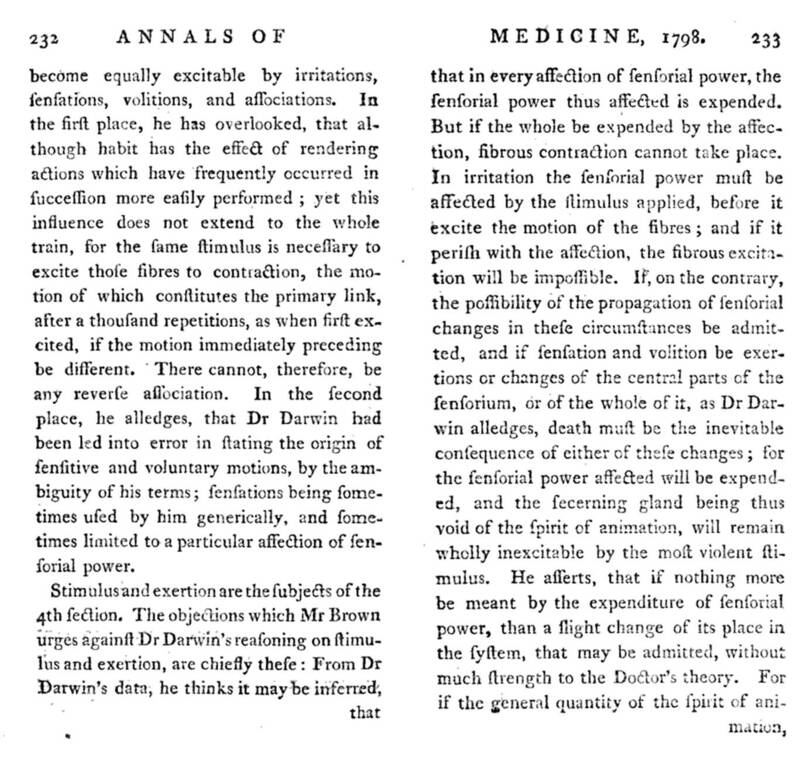 That metaphysicain was John Brown, the author of Elementa Medicinae published in 1780, a philosophy that became very popular and helped initiate the study of chemistry as a physical science and physiology and medicine as a single combined metaphysical chemical and toxicology science. 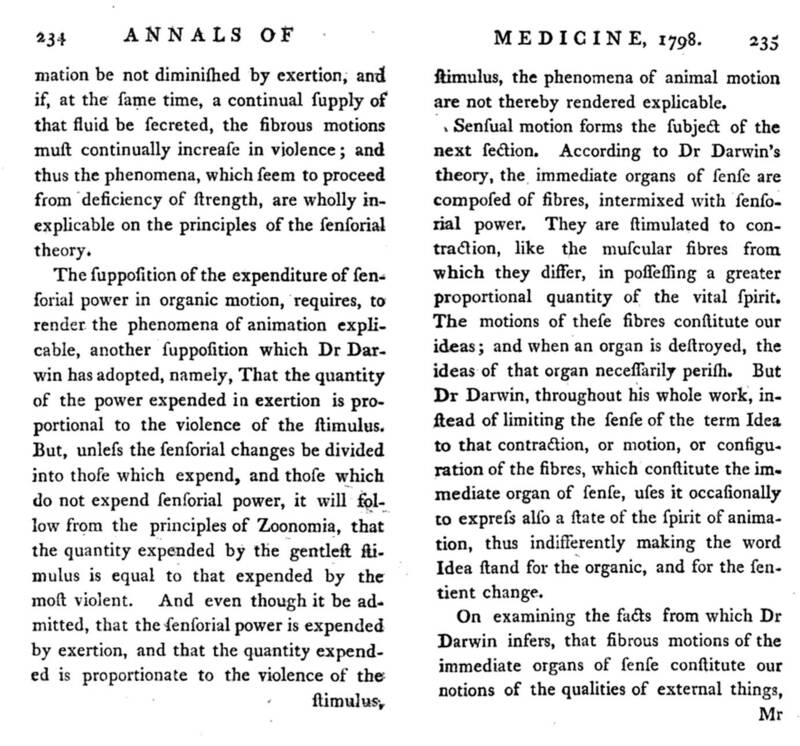 Erasmus’s work incorporated some of the early religious and science metaphysical teachings of vital force, atomism, and natural growth and change (not yet evolution) into his paradigm on existence, natural selection, life and health. Oppositional thoughts would later surface when his grandson Charles gave his own personal rendering of these scientific teachings, updated for the time due to the new concepts introduced by the more recent authors. 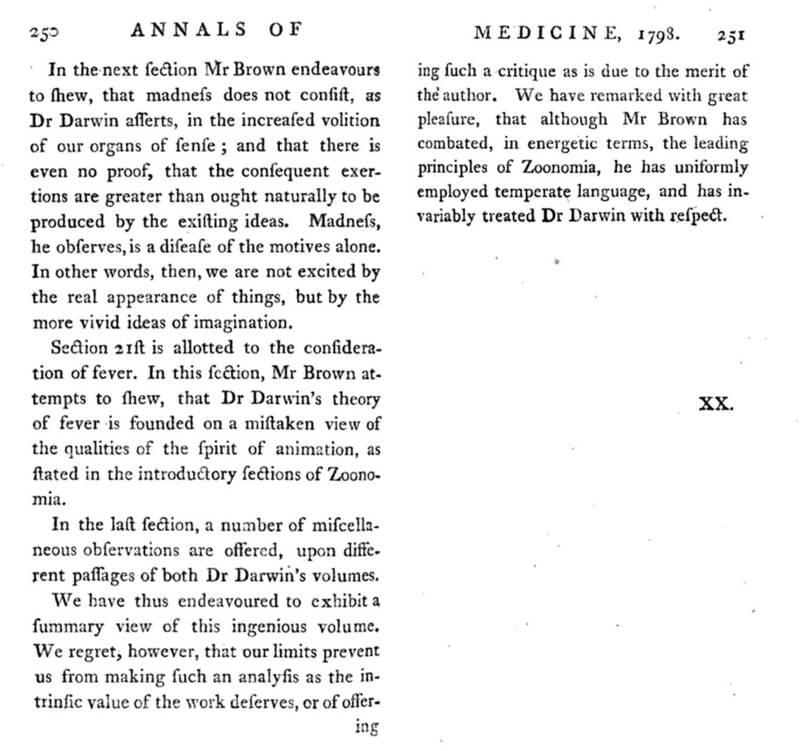 Charles’ grandfather’s surname, Darwin, wasn’t enough to draw the public towards his writings, essays that would ultimately supercede his grandfather’s work on Creation and natural selection, life and disease processes and in fact bury many of Erasmus’s published impressions of the world for good. The metaphysical portions of Erasmus’s theory filled the needs of those not yet willing to give up the religious teachings too readily. Its focus on nature was focused enough upon the physical world and its physical make-up to prepare its readers to what subsequent writers will produce. Two generations later, the atheism of the time, better thought of as agnosticism, was replaced by a much truer form of atheism. 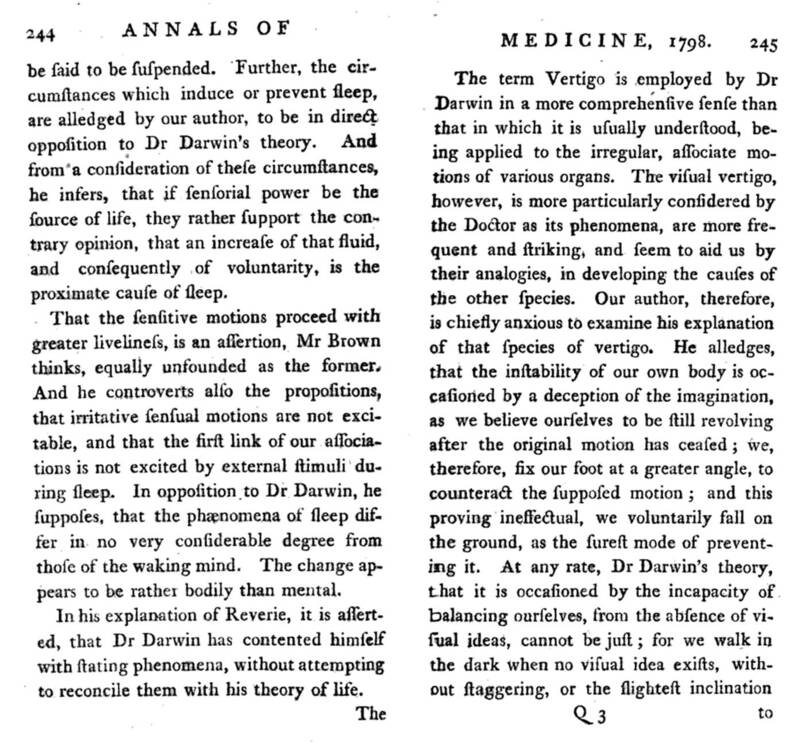 The nature of Charles Darwin’s renderings of evolution, over Creation was not only anti-theistic , but also atheistic. For Erasmus this was not the case. It was due to Charles Darwin’s writings that the next discoveries would be made needed to “prove” (again a very much interpretive and philosophically based claim) that this next generation Darwinist thinking was correct. Natural selection processes were at work, most of which were biological and ecological in origin. Lamarck’s concepts were still an important part of these theories regarding creation of man over time, but they became second to the natural creation and selection process. Natural selection replaced the Lamarckian interpretations preceding it in the step ladder to understanding nature as a system, and life as a process of change. Life was no longer simply the main product of a theoretical Creator and the Garden of Eden. 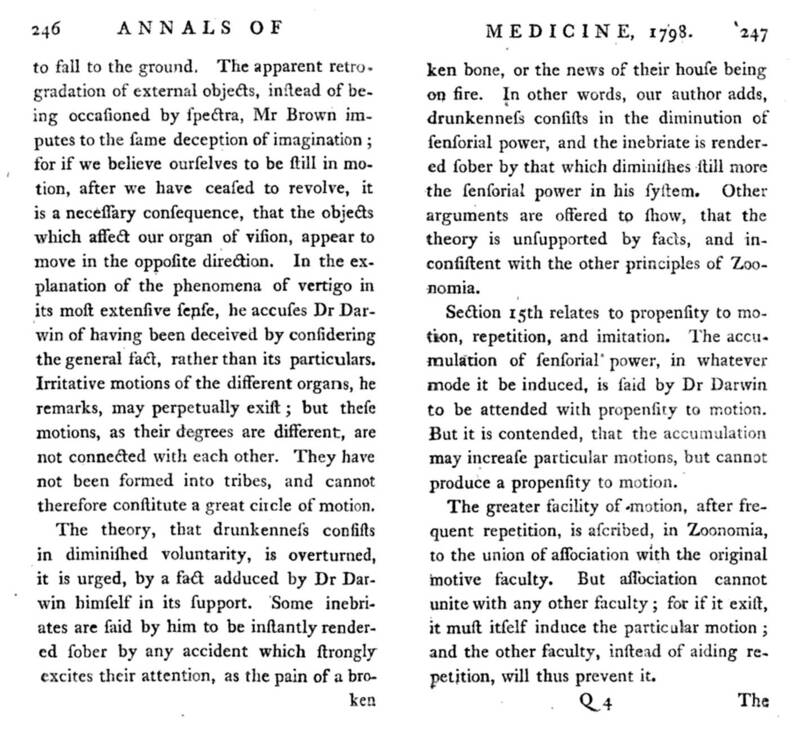 The writer of the Zoonoist belief is effective at not only describing this belief system, but also relating it to other philosophies common during this time, like the beliefs in pure brunonianism now reaching their end stage and those still beliefs focused on the recent discovery of the recovery of life from a state of suspended animation. 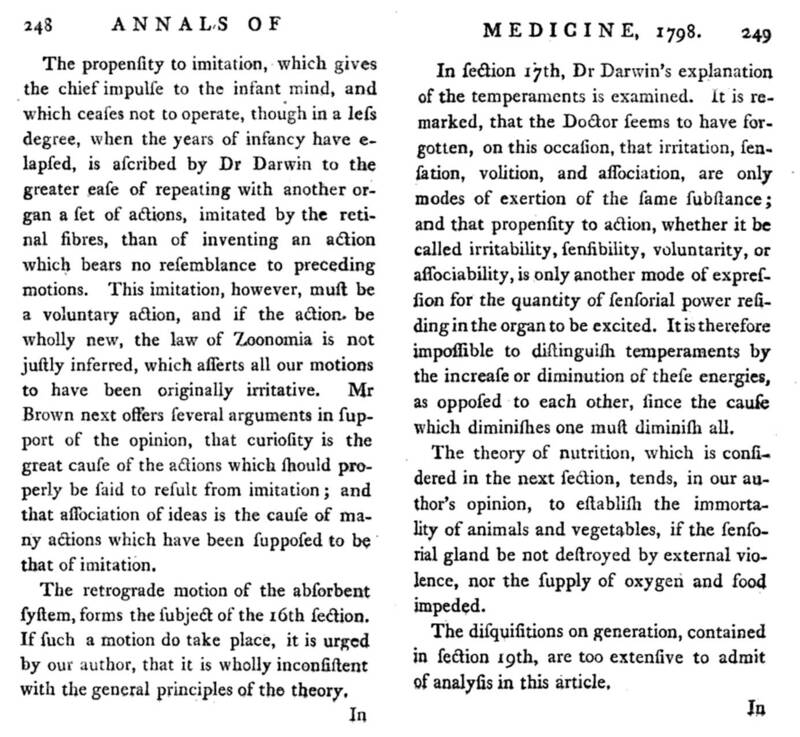 Some of the most important disease related questions at this time were ‘do diseases of the soul exist?’ and ‘is there a relationship between emotion, spirits and imagination in the development of sickness?’ Both of these questions can be answered using Erasmus’s Zoonoism philosophy if we read deeply enough into its content, an example of imagination working at its best for the time, a common cause for disease according to the much earlier Dutch writer, metaphysician, physician and philosopher, Hermann Boerhaave.